You must know that your resume is the entry for your career. So it is very very important that how you present your resume. A normal resume has its own structure or template.. moreover its a formula. Heading: Be sure to place your name, your current address, and your current phone number at the top of the page. Make it easy for an employer to reach you. Note: If you are away from home much of the time, you might want to list an alternate number. 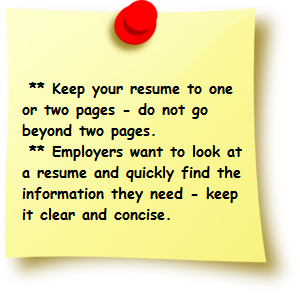 Remember: if you move, change your name, or change your phone number; change it on your resume. Objectives: It is wise to have an objective. The employer needs to know what position you are seeking. You do not need to explain your long-term objective; he is only interested (as far as the resume is concerned) in what you want to do at the present. Objectives should be short and to the point. What you have to "Do" I am looking for a position of responsibility in the printing industry, utilizing training and “hands-on” experience in photo typesetting and camera-ready layout. Salary: Do not mention salary - either from previous employment or from expectations for your new position. Usually, your resume has to sell an employer on giving you an interview. Interviews get the job; resumes can only get an interview. Very often, personnel people will pattern the interview on the resume they have received from you. 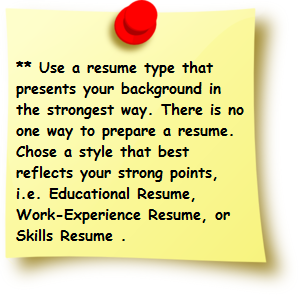 Thus, it is essential that you have a resume and that it be a good one.